by Bill Dwight on Monday, October 04, 2010 at 8:10 PM | LEAVE A COMMENT! We’re constantly scouring the Internet looking for articles related to family finances and teaching kids good personal finance habits. You can visit the FamZoo delicious page to see our ever growing list of family finance bookmarks. Each week, we pick our favorite articles from the previous 7 days and post them here. I love the concept of being thankful for what you have and instilling that notion in our kids. That's what drew me to Vivian’s post about "On Gratitude" - a new book by Todd Aaron Jensen. The book contains a collection interviews with 51 celebrities. OK, normally, not my favorite subject matter, but these celeb profiles are different. The interview question? What are you thankful for? Initially skeptical, I read through some of the profiles on the Amazon preview - like Ray Bradbury's - and found them to be quite fascinating. Lots of kids are drawn to celebrities, so this might be a clever, engaging way to introduce them to the concept of being grateful for the non-material things in life. It might be fun to read the book together. I'm still searching around for a couple more detailed reviews before I pull the trigger on purchasing the book. There are actually a set of negative ratings on Amazon right now, but they all seem to be associated with some mix-up regarding an incomplete pre-order version of the Kindle download. Anyway, even if the book falls short (in spite of the excellent snippets I read), I love the concept, and Vivian’s post summarizes some nice suggestions for creating “gratitude opportunities” with your kids. With more parents putting debit and prepaid cards in the hands of their teens, it makes sense for both parent and teen to understand your exposure when it comes to a lost or stolen card. How does it compare with your liability for a lost or stolen credit card? If you’re considering going this route with your teen, you’ll want to read up on some of the details and loopholes outlined in Karen’s article. You might just want to read it (and the comments) for your own edification too. 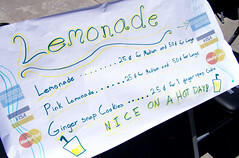 Imagine your kid setting up a lemonade stand that accepts not only cash, but credit cards too. Sound crazy? It might actually be right around the corner. Check out David’s article and see how.